July 12, 2011 by Ken Ward Jr.
We’ve noted before (see here and here) that Rep. David McKinley, R-W.Va., is trying to be among the leaders in Congress in putting a stop to U.S. EPA efforts to better regulate mountaintop removal and for the first time really regulate on the federal level the handling of toxic coal ash. Congressman McKinley (R-WV), author of the bill to restrict EPA’s ability to regulate coal ash, reported over $185,000 in political donations from mining and electric power interests, including both PAC and individual totals. More than a third of that comes from corporate or individual donations from four coal mining companies: MEPCO ($34,700); Alpha Natural Resources ($11,000); the International Coal Group ($15,900); and Patriot Coal ($10,000). This week, the House Energy and Commerce Committee is expected to vote on two bills, both supported by heavy contributions from electric power and coal mining interests. The so-called “TRAIN” bill would require EPA and federal agencies to aggregate the cost of all pending regulations to reduce pollution from coal-fired power plants, as part of a broader attack on those standards. The second would limit federal oversight of state coal ash disposal standards, and make it virtually impossible for EPA to take enforcement action against polluters who violate those requirements. Energy and Commerce Committee chairman Fred Upton (R-MI), an original sponsor of the TRAIN bill, reported a total of $96,650 in contributions from mining and electric power political action committees, and individuals who work for or represent those industries. DTE Energy’s political action committee and employees have contributed $13,000 this year, the National Mining Association, Peabody Energy, and Alpha Natural Resources (new owner of the Massey mines) have already chipped in $5,000 apiece, and at least six power companies have donated that much: Ameren, Dominion, Duke, Edison International, Exelon, and American Electric Power. House Energy and Power Subcommittee Chairman Ed Whitfield of Kentucky, cosponsor of both the “Train” bill and Representative McKinley’s coal ash legislation, reports $51,250 in donations from coal and power interests. Other Members receiving more than $25,000 from these industries in 2011 include Republicans John Shimkus of Illinois ($37,750), Joe Barton of Texas ($32,400), and Tim Murphy of Pennsylvania ($29,500). 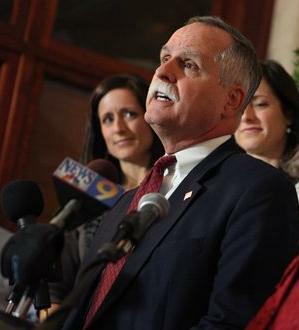 The quarterly report filed by Congressman McKinley’s office did not identify the occupation of 48 donors who contributed $500 or more, although federal election law requires such disclosure. Those individual donors are included in the McKinley totals where research indicated their connection to coal mining or power companies. Data available from the Federal Election Commission show that six members of the Energy and Commerce Committee have received a combined total of $433,000 so far this year from the mining and electric power industries that stand to benefit from this coal-friendly legislation. The data reflect corporate contributions from January 1 through May 31 of 2011, or from lobbyists or employees of those companies and their family members. No doubt the Congressmen receiving these large sums are sincere in their support for legislation that coal interests want so badly. But are politicians who raise such large sums of money from coal the best qualified to rewrite regulations that affect that industry? Or should these standards be set by EPA, after taking into account both economic cost and the public’s interest in a healthy and clean environment? That is a question the American people will have to answer. Congressman McKinley (R-WV), author of the bill to restrict EPA’s ability to regulate coal ash, reported over $200,000 in political donations from mining and electric power interests, including both PAC and individual totals. More than a third of that comes from corporate or individual donations from four coal mining companies: MEPCO ($32,200); Alpha Natural Resources ($17,000); the International Coal Group ($15,900); and Patriot Coal ($10,000).